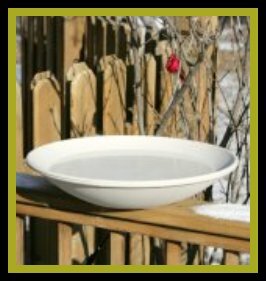 Birdbaths are an excellent way to attract birds to your garden. Birds come to our garden bird bath all year long. I've looked around at different stores and they can get pretty fancy and pricy, but I prefer the simple more whimsical and colorful types, compared to the more ornate types. When it's hot outside there is nothing better than a nice cool splash in the closest watering hole. Well, birds feel the same way. Birds prefer nothing deeper than 2". So, that makes the terra cotta saucers the perfect vessel to make into a bath. The terra cotta saucers that I use to make my mosaic bathare 14"-16" in diameter. They are easy to find at most any store. 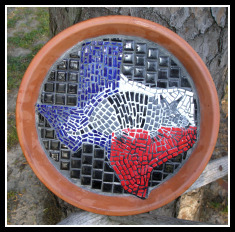 Sometimes, the designs that I choose to mosaic, have nothing to do with fish, waves, or anything related to water. I decide on what I like, I draw my design, and begin the mosaic process. Of course I am a little partial to these baths because of the love I put into each one, but to be fair, there is a wide variety on the market for you to choose from. 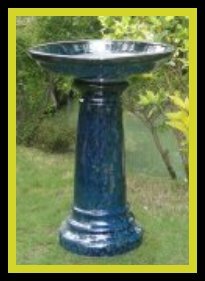 The pictures on this page are from www.Birdbaths.com. Visit their site to see close-ups of all photos. 1. 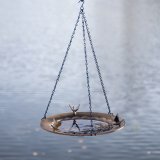 The Hanging Bath: As you know birds like to "hang out". So, what better way than with this model. You can hang them from a tree, a rod, or a stake. This is a good bath to choose if you have a lot of wildlife like raccoons, deer, etc. around your garden. 2. The Copper Bath: This solid bath has a very natural look. They are usually hand crafted and over the years they turn that lovely green (patina). Some come with there on stand. You will be pleased with the many enchanting styles. 3. Metal Bath: These baths have a very alluring antique look with their very precise and intricate details. They have a wonderful old world magic, are very well made, and make excellent gifts. 4. Ceramic Bath: Like the mosaic bath, it is also very beautiful. They are hardy pieces of garden art. They hold up to rain and cold weather. Some have hand painted details on them. Also, if you have a very plain bath, you can embellish it yourself with all kinds of doodads. I like to use colored stones or glass, and ceremic pieces old and new. Most anything will work. 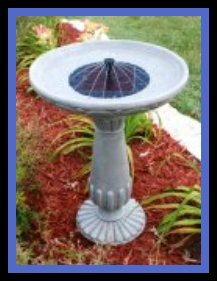 Then there is the Solar Birdbath: They use the suns energy to make a fountain that the birds love. Of course they don't require electricity or wiring. 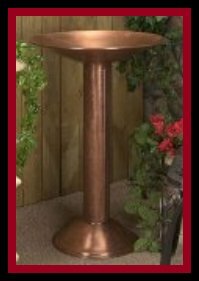 Just put it in a sunny spot and you are ready for your guests. During the winter months, have you ever wondered, where do the birds that don't migrate go when it's really cold outside? Well, they go to the neighbors house that keeps there bird feeders filled and who have a Heated Birdbath. So, if you want this person to be you, then you know what to do. Whatever style or material that you choose for your bath, I know that you will enjoy watching the birds splish and splash around. You can place them anywhere in your garden. I put mine close to my feeders. So, basically if I add in the bird house, I am running a "Bed and Breakfast" for birds. Ha! I love it. My garden really does attract so many different kinds of birds, squirrels, raccoons, and opossums. You would never know that I live right next to an interstate highway. If you can't tell by now, I love my garden. My entire yard is my garden. It was a small enclosure in the back yard, but after a few years it has grown. I also have "sitting areas" in different places and ,yes, you guessed it, one of my favorite places is near my bird bath. While my husband and I de-stress we play a game called, "can you name that bird"? He usually wins, but that's ok. I tell him he wins because he is such a "bird brain," Ha! "Goodies Store" Page 1 and Page 2 or go to www.Birdbaths.com, I know that you will see something that you like.